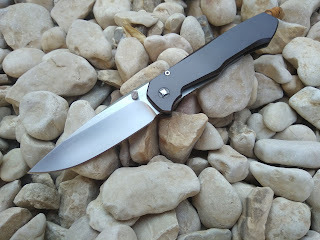 Best Chinese Knives: Lochsa Integral Clone Aluminum Knife Review: Sebenza on steroids! Lochsa Integral Clone Aluminum Knife Review: Sebenza on steroids! I got this knife and would like to do a short review of it. The knife came in a presentation black box. Out of the box there have been some issues: the action was a bit gritty and the knife wasn't very smooth. There also were a couple of small nicks on the edges of the aluminum handle, burr on the blade tang and the lock was a bit stiff. Other than that it was great - no lockup issues, blade was centered and came razor sharp. I immediately disassembled the knife and found out what caused it to be gritty - some dirt inside the pivot area. I cleaned it up with WD-40, lubed it, took off the burr from the tang and assembled it back. Then I saw what is causing the lock to be stiff - the ti pocket clip pushed on the sub-frame lock bar, so I pushed it back a bit. After all this work (that took about 15 min), the knife started to function awesome! - The materials and features: the knife is made from a solid chunk of aluminum, has a titanium sub-framelock with a steel insert, ti, pocket clip, awesome angled thumb studs, double row steel bearings and a D2 blade with beautiful vertical and horizontal satin finish and a rounded spine. Also comes with a brown genuine leather lanyard. - The construction: it's actually my first integral knife and I loved this way of making a knife. It also has 3D machining on the aluminium handle and on the lock bar, so the handles aren't flat, but have curves, like on the genuine Lochsa. - The pocket clip: is made from titanium and has just the right amount of tension. I also liked the fact that it is positioned tip-up, while the genuine Scott Cook Lochsa sometimes comes with a tip-down clip. - The fit, finish and machining: Except those 2 small nicks on the bottom of the handle (could be because of the seller) the details are great. - Ergonomics are great, largely because of the shape of the handle and the fact that it has an integral construction. - I like that although it is a clone, it comes without the logos, and has a slightly different design, so couldn't be considered a counterfeit. - The price and the bang for the buck. - Proprietary screws: are beautiful and could be turned pretty easily with a pair of pliers, but I still would have preferred usual torx screws. - The gimping on the spine doesn't really work, but it is about the same way on the original.- The condition out of the box and 2 small nicks on the handle. - Overall I feel like this is a great knife to have. I probably won't ever get a genuine Scott Cook Lochsa (as of now I'm not ready to spend $2K+ on a knife) and even if I will eventually get it - I certainly wouldn't use it. This knife provides the opportunity to get a Lochsa style knife that you can actually use and that is a great thing, because trying out an integral handle at work is an awesome experience, that makes you understand why those are being made. It also carries very well and is a much better choice to buy than a clone Sebenza. nice writeup. wats the weight on this? I have this on my list right beside the Ti Zieba front flipper (I just received a blue steel Zieba G2 clone with slight imperfections, Ti would be nice, or at least handles milled on the inside). Don't worry about those nicks though. I have a Real Steel Griffin, button lock folder with black anodised aluminum handles. Nicks and scratches appeared already and I'm thinking about to go around the edges with fine sandpaper or to give it a stonewashing. I have one as well (a black one), will review it soon. It does feel dense, but I'm pleased with mine after disassembly and cleanup. Endre, I also ordered one of the blue steel Ziebas which is now waiting to clear customs. What do you think of the knife? Sounds like it felt heavy to you? It's pretty light I thought but very thin, so maybe it feels dense. The Swindle feels too heavy for its size (esp. with the clip that's only working on soft pockets), with the Zieba I'm ok. Of course, Ti or milled handles would be cool but it's not a big issue with the Zieba. I got a lemon though, the blade didn't close properly so I had to do some milling just to find out that the arc from the detent ball is not hitting the detent hole at the correct place. It's not held in with enough force so I have to tweak the detent hole, too.